It’s a bright, warm September afternoon when my husband, kids, and I enter the cool garden of True Nature during their annual celebration, Sacred Fest, a three-day event featuring yoga, music, and chef-inspired plant-rich foods. 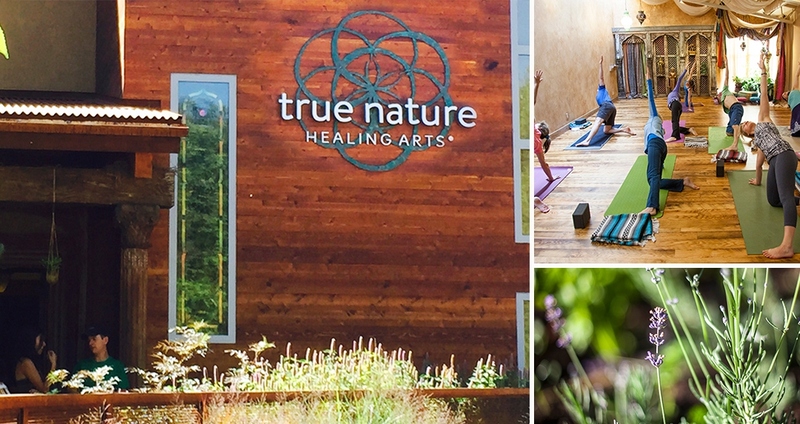 True Nature, a center with class space, massage rooms, café, outdoor gardens, and walking paths, is nestled in the heart of downtown Carbondale, Colorado, a small, down-to-earth mountain town near Aspen. The beautiful two-story building marries the warmth of ornate architectural elements from Kashmir, Afghanistan, India, Pakistan, and Morocco with the simplicity of modern architecture. In fact, the building was formerly an architecture firm, co-owner Deva Shantay tells me later. The property radiates the richness of Indian culture with the light and spacious aesthetics of the West—its natural beauty and clear skies. After my family and I enjoyed music on the lawn, I wandered through the gardens until I found the 5-Element Reflexology Path, embedded with hundreds of smooth stones. As I massaged the soles of my feet over the path, I wondered how something so simple could feel so amazing. “There are seven thousand nerve endings in the feet, related to every system in the body,” Eaden later explains. Over in the food area, the chefs serve up homemade coconut milk–based ice cream with fresh berries and nuts. Who could resist healthy foods that taste this good? True Nature’s line of “high-prana” (energy) organic snacks, cereals, entrées, desserts, and beverages are all vegan as well as gluten- and dairy-free. Co-created by chefs Dave Avalos and Pam Davis, True Nature Foods will become more widely available in natural products stores soon. The café menu and product line derive from an Ayurvedic food philosophy of creating balance, and use “quality ingredients, cooked as little as possible to maintain the energy of the food, eaten as close to the earth as possible,” says Eaden. By the time we left True Nature, the sun had set on Carbondale. Late-summer crickets chirped in the dry grasses. I felt lighter, less worried, and more content than I had for quite some time. We would definitely be back in a few months, as Carbondale has become our favorite low-key, off-the-mountain spot when we ski Aspen or Snowmass. A sanctuary for busy lives, True Nature seems a perfect place to stop for a warm wholesome meal, massage, or yoga class next time we ski. To learn more about True Nature, visit www.truenaturehealingarts.com.